Looking at these first test stitches made by a 1918 Singer 99K, you would not be able to tell that two days previously I was hardly able to turn the wheel. This is the machine which has the improvised repair, the thread guide made from a safety pin. The next big problem was that the mechanism was well and truly gummed up; in fact, so stiff that I was nervous of turning the handle too much in case I suddenly discovered a bit of hidden metal fatigue. The last thing I wanted was a snapped handle, so much of the time I was turning the wheel by hand. First I cleared all the accumulated fluff from underneath the bobbin plate and needle plate and from behind the face plate. Next I cleaned up the stop motion screw and checked that the wheel was able to move freely. Then I gave the machine a very liberal oiling, and found that the movement was still very stiff, even after leaving the machine for hours to give the oil time to penetrate. After a few turns the machine would start labouring. Somewhere there was a gummed up joint, but it wasn't obvious where just by looking. I could hear it creaking, and decided that the sound was coming from the bobbin mechanism underneath the machine. One or more of these joints was objecting. The answer was paraffin, which I have used before to unstick stubborn parts. I wrapped a piece of old cotton rag around the entire bobbin mechanism, tied it with string, and soaked it with paraffin. Then I left it in place overnight, and this is how it looked the next morning - clean and very dry. The paraffin had removed all the fresh oil and all the old oil residue that was causing the problem. Once I had re-oiled underneath the machine, it turned freely. Now that I was able to turn the handle, it was obvious that the handcrank needed more oil than I had already given it. Essentially, the handcrank is made up of two cogs, which both need oiling. The lower cog is oiled next to the large central screw, just behind the handle. The cocktail stick shows the oil hole. Note mug of tea lurking in the background. It helps. The upper cog is oiled at the top of the arm that connects the handcrank with the wheel. The machine was then left overnight, and next morning all I needed to do was wipe off the excess oil, especially from behind the handle, where it oozes out, bringing out black muck that has been hiding there for years. If you are too enthusiastic, and turn the handle before dabbing off around it, you can end up getting splattered. And finally I had the thrill of getting this machine sewing for the first time in decades. Beautiful stitches, every bit as good as I had hoped. Red in the picture is provided by a tiny photobomber. Union Jacks again, this time with blue as well as pink. There are even daisies on blue to go with the daisies on pink. And the pink binding has just the right shade of blue to go with the border. Yes I know, life is getting repetitive around here. Yet another cradle quilt much like the last one. Life has been busy, and rather than get nothing done I am happier getting a little quilt finished, even if I am working to a formula and using nil imagination. It's the wrong time of year for that. It's well and truly dark by 5 o'clock, for goodness sake. Why aren't I hibernating? So, if you are tempted to throw together a quick project for a baby, here are the measurements for the top: a 9 inch square in the centre, framed by three strips of 2 and a half inches, with a 4 inch border to finish. Sandwich, quilt, bind. Job done. Told you it was quick. 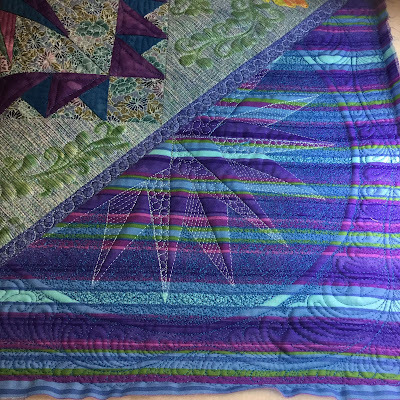 The project in Week 70 that really caught my eye was Katy's pieced top quilted with swirls, which she decided on after doing three wonderful FMQ practice pieces. If you haven't seen her blog post yet, nip over now and see more photos. One of the windows in a church near here, this one depicting St. Elizabeth of Hungary holding a basket of roses - just a few feet away is St. Patrick. Last week I visited Flights of Fancy, the exhibition of Angela Knapp's work at Midsomer Quilting, and was totally bowled over by her work. She has combined her fascination with birds, her artistry, and her skills with needle and thread to produce a beautiful collection of pictures. As depictions of birds they are incredibly accurate - I identified this peregrine falcon straight away. This one foxed me, though, because I was thinking of British birds and I was thrown by the scale. It is a humming bird, with subtle shades of blue, turquoise and rusty reds and browns. Next to the visitors' book Angela had left her scrap book open, so as well as enjoying all the pictures, visitors could read facts about the birds and see how she had prepared each piece. Also, Angela was on hand, working on her exhibit for the forthcoming 12 x 12 exhibition, so she showed me how she achieves such amazingly realistic effects. It was an absolute delight meeting Angela and seeing her work. If you want to find out more about the exhibition, and read about her techniques, visit her blog at The Cary Made. Or, better still, if you are able, visit the exhibition! It was time for a hefty dose of pink this week, after having made so many quilts for baby boys in recent months. This cradle quilt measures just a fraction less than 27 inches square, and was very quick to make. 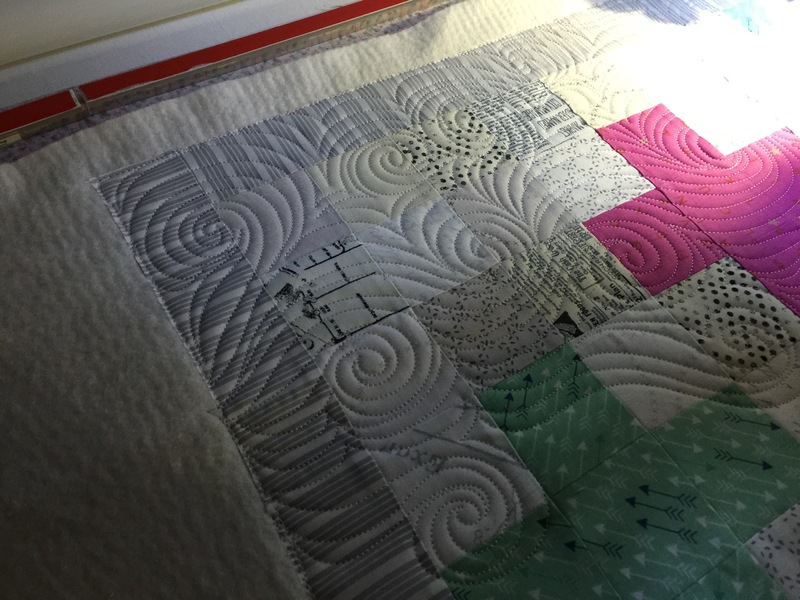 The top was pieced on Monday, the quilting done on Tuesday, and the binding put on on Wednesday. After banning myself from using anything pink or with flowers in the boy quilts, I was all of a quiver when I was working with these daisies. The Union Jack fabric in the centre isn't short of pink, either. ...so there is a line of hearts running along the binding. Meanwhile, on the back, there are rabbits with pink ears and pink ribbons. How girly can you get? The project in Week 69 that really caught my eye was Cynthia's bold red and grey quilt, made using scraps. 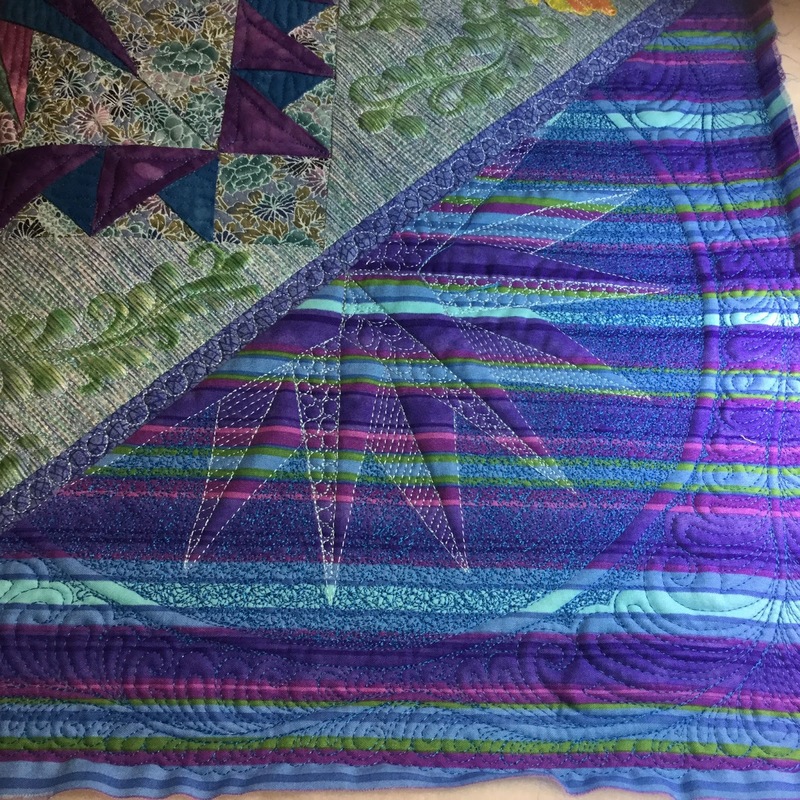 She used a wiggly swirl for the FMQ pattern - I must try it some time! 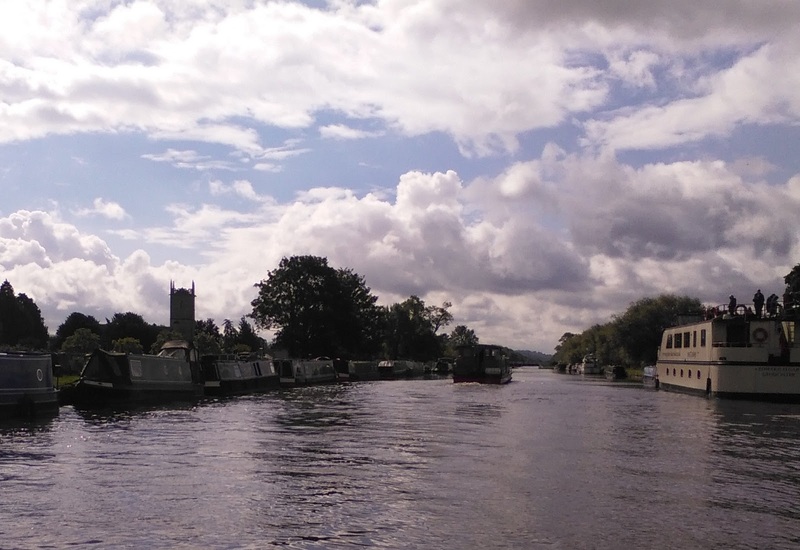 If you haven't seen her blog post yet, nip over now and see more photos. A quiet day at St Winefride's Well In Holywell, North Wales. Have you ever had the feeling that you have inadvertently made a fancy truss? Or a bodice for the woman with the cylindrical figure? This is the quilted panel that I started last week, cut to size, bound at one end and with a buttonhole band stitched to the other. It was a great excuse to play with one of my favourite gadgets, the buttonholer. And here it is transformed into a cushion cover. I used up fat quarters that I originally intended to use for bindings, but the fabric was a touch thick and frayed too readily. Brown isn't a colour that looks particularly marvellous in our house, but I know someone who loves brown, and it will be just right for her settee. ... and all the pale grey-brown went to the back. The pieced buttonhole band was made from an offcut from the main pieced panel, and the three dark brown buttons I found lurking in an old button tin in a charity shop. I think I prefer the back to the front. The project in Week 68 that really caught my eye was LeeAnna's demonstration piece, a free motion quilted sketch made with paint sticks. So colourful! (Especially after working with brown.) If you haven't seen her blog post yet, nip over now and see more photos.